CCOG Gardeners are kicking off a new year! Posted on February 27, 2013 | Comments Off on CCOG Gardeners are kicking off a new year! Our first meeting of the year is coming up! CCOG’s mission is to work as a community to share, learn and teach organic gardening practices. Our overall focus this year will be to work collectively to share our gardening knowledge with each other. 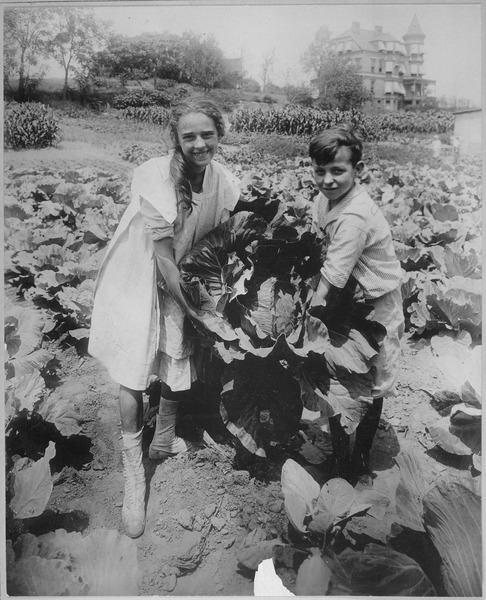 Perhaps, working together we could learn how to grow cabbages this large! The theme for March will be Starting Seeds. CCOG gardeners will share their tips and tricks for starting seeds for the 2013 gardening season. If you have a favorite technique for starting your plants, we would love to hear all about it. If you are a beginner, come and learn! As usual, we will have light refreshments planned and a free raffle. Feel free to bring a tasty treat to share with the group or if you would like to add to the raffle, we always welcome donations. Jeff Abbe will have our swap/donation table up and running again! Anyone can contribute extra seeds, plants, gardening magazines, books, extra produce, garden tools, etc. to donate or swap at the table. We welcome brand new gardeners as well as those who have a lifetime of experience. Whether you garden at home or in a community garden, on your patio or windowsill, you are welcome to join us. Our meetings are free and open to all! Comments Off on CCOG Gardeners are kicking off a new year! The Mission of the Capital City Organic Gardeners is to collectively share, learn and teach organic vegetable gardening methods to each other. 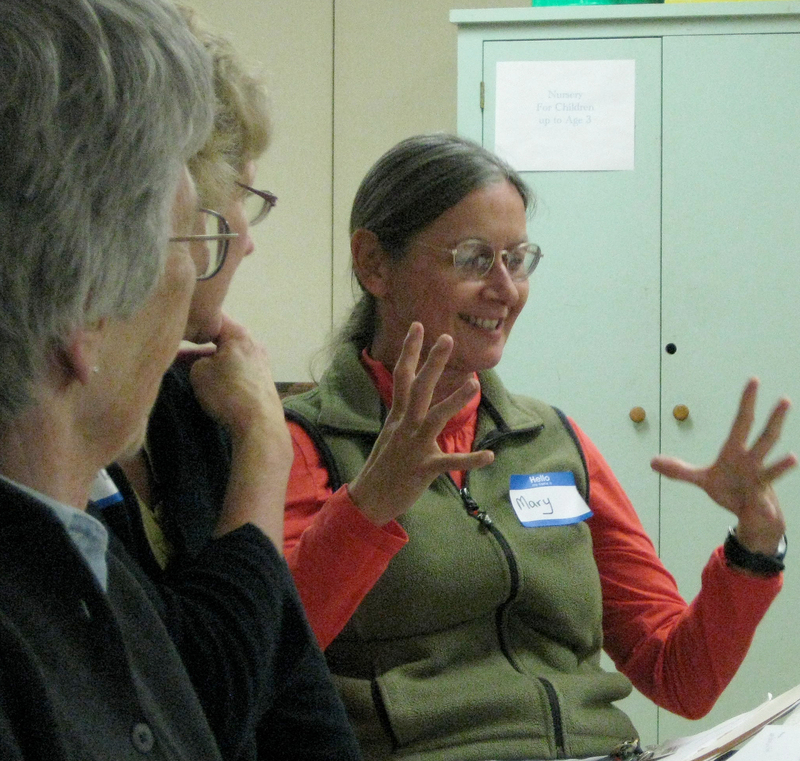 For our May meeting, CCOG gardeners shared their tips for growing perennial edibles. We talked about dandelions, asparagus and rhubarb for this meeting. There are so many edible perennials that gardeners can grow. We only touched on a few and filled the hour! Starting out with some yummy treats, Mary brought in some delicious Dandelion Cheese Squares to share with the group. Thinking about dandelions as a vegetable and not a weed takes a shift in thinking but the truth is that European settlers brought dandelion seeds to America for food and medicine. The health benefits from eating dandelions are astounding. As one of the first greens that appear in the spring, it would benefit all of us to learn more about it’s healthful properties and work to incorporate dandelions into our diet. Caution! When gathering dandelion greens, make sure you harvest young greens from areas that have not been treated with lawn chemicals. 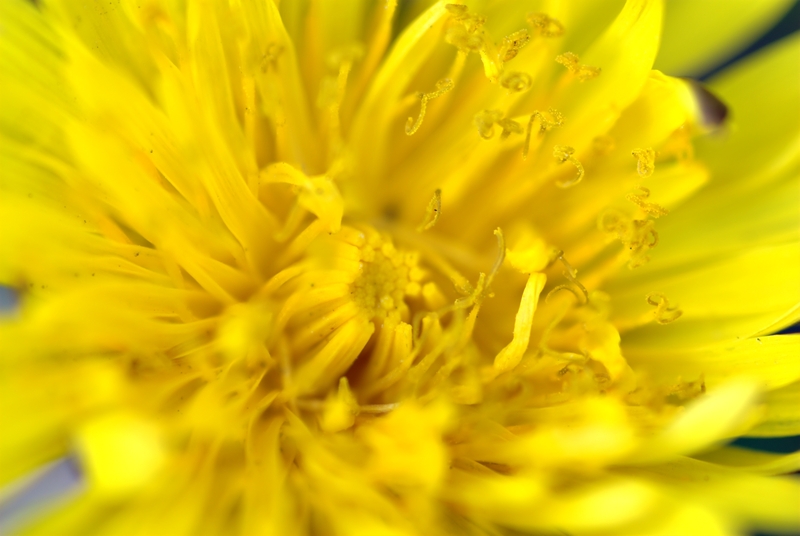 Check out The Health Benefits of Dandelions by Aparup Mukherjee. For advice on cooking dandelions along with some other wild greens, download this article, Facts on Edible Wild Greens in Maine. Karen did some research on asparagus to share with the group. 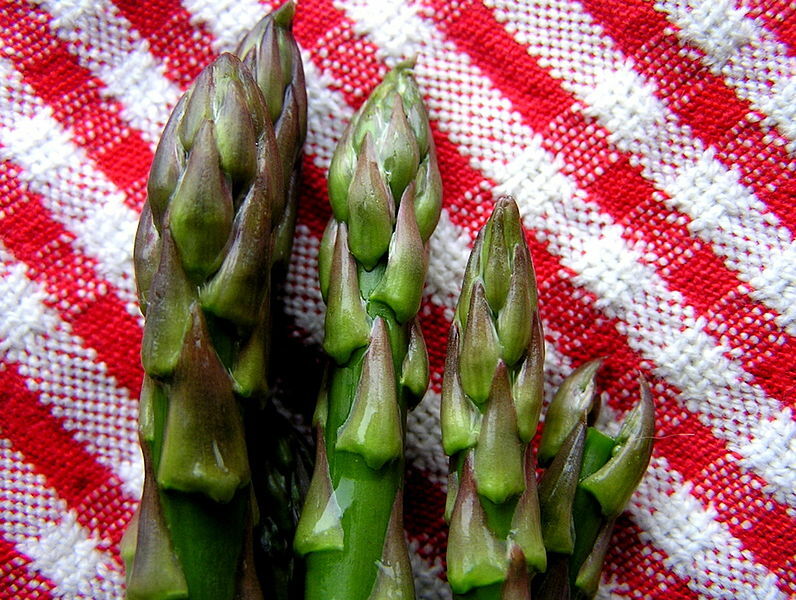 Asparagus needs sandy, slightly acidic, well-drained soil and should be planted around 8″deep. They enjoy 6 to 8 hours of sun a day. Make sure the rows are 2′ apart. Dig a 8″ deep trench and plant the crowns 12-15″ apart. Cover with 2″of soil. As plants begin to grow, keep adding soil 2″ at a time until it is mounded up into a hill. When choosing asparagus to plant, consider choosing Jersey Male Hybrids. They are the most prolific. The first and second year that the asparagus comes up, do not harvest. Let the stalks grow into ferns, then cut the ferns back late in the fall after a hard frost. The ferns provide energy to the plant. You can tie up the ferns with stakes and twine so they don’t flop over and stay neat. The third year you can start to harvest. Cut the asparagus when it is 8″ to 12″ tall. Cut for the first 10 days to 2 weeks, then let the asparagus go to ferns. Each year, you can cut more asparagus for a longer period of time as the plant becomes more robust. Establishing an asparagus bed takes time and patience. However, once it is established you can harvest this spring vegetable for up to 20 years! What a treat! 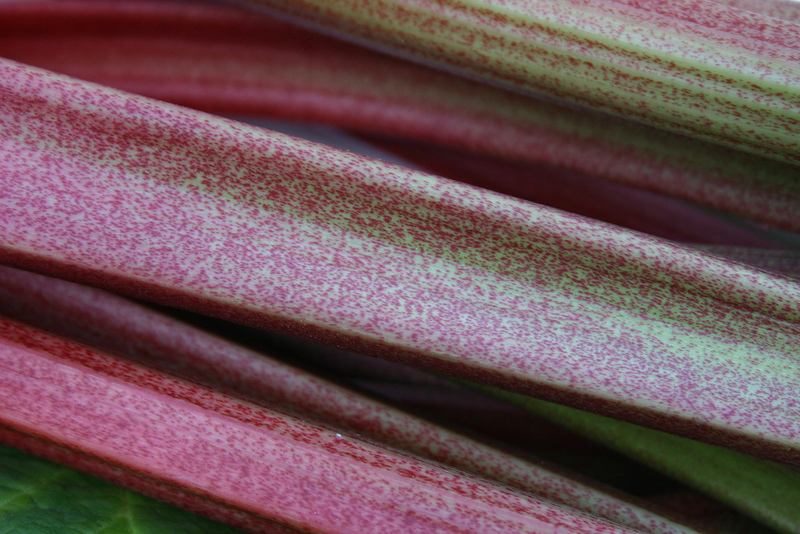 Claudia shared her experiences with growing rhubarb. This tart plant originated in China. Once you establish a patch of rhubarb, you have it for life! To plant, dig a nice big hole, add in a little manure, then plant it and let it go. Rhubarb can tolerate some shade but not too much. The first year, don’t harvest the stalks. The second year, pull a few for a pie or two. To harvest, pull and twist out the stalks. After that, you can harvest almost as much as you like. Pull stalks that are about the size of your thumb for the best flavor. Be sure to leave at least a third of the plant at the end of the season. Always cut down the flower stalk when it begins to appear. A final word of caution! Never eat rhubarb leaves. They are poisonous. Just cut off the leaves and throw them in your compost. Use the stalks for cooking. Check our the article that Claudia wrote for the Concord Insider entitled, “Rhubarb-a neighborly plant perfect for pies” . We all enjoyed our meeting sharing our knowledge with our fellow gardeners. So many fruits, vegetables and grow as perennials! You can pack an entire garden with edible perennials and enjoy eating from your garden with very little labor. For a complete list, download this handout. Please note: Not all of the plants are appropriate for New England, so do some more research before planting. Karen Shields read this at our last meeting. Enjoy! 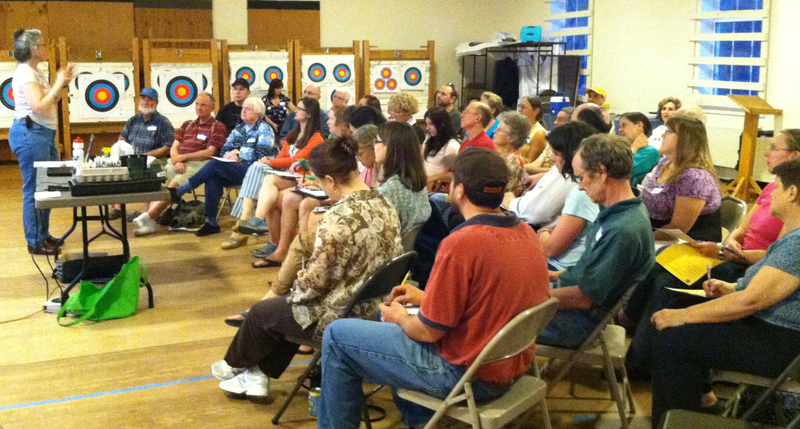 We had a terrific turnout for our first meeting of 2012! Donna Miller was our speaker for the night. Donna is a Master Gardener from Canterbury. Over the past 10 years, she and her husband, Jim, have converted their yard into beautiful theme gardens including children’s, butterfly, heritage, fairy and Halloween gardens. Two years ago they opened Petals in the Pines to the public. Donna started out the talk with a question. Why start your own seeds? The answer is that you can grow a huge variety of vegetables by starting your own seeds. If you only buy your plants from a local nursery, your selection of seedlings is very limited. It’s fun to experiment with different and unusual varieties of plants. 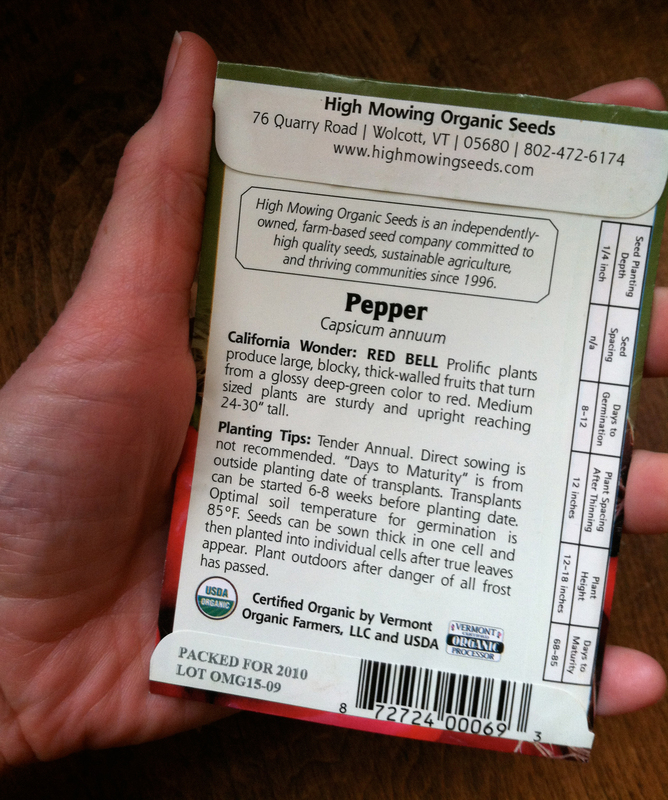 When starting seeds, the first thing you need to do is READ YOUR SEED PACKET! The seed packet normally has all of the information you need for planting. Follow the directions on your seed packet! Our area has a 120 day growing season that starts around Memorial Day. Your seedlings should be ready to plant in the ground by then. If you read the back of your seed packet, that should give you all of the information you need about when it is time to start your seeds indoors. For example, if your seed packet says that transplants can be started 6-8 weeks before planting date, then you should start your seeds early to mid-April for planting on Memorial Day. To start your seeds indoors, all you need are containers with drainage holes, seed starting mixture, water and light. Containers: You can use any container you like. Many people reuse the containers they get from the garden store. Just make sure that they are scrubbed perfectly clean with soap and hot water. You don’t want to transfer any plant diseases to your sensitive seedlings. You can also use containers you have around the house like food containers. Just make sure to poke drainage holes in the bottom. Soil: Use a fine, uniform, well aerated, loose soil especially formulated for seedlings. Promix is a good medium to use. Fill your containers with the soil to the top and water the soil. The soil will absorb the water and settle down into the planting container a bit. Planting: Follow the planting depth recommended on the seed packet. Lightly firm the soil over the seed but do not pack down.Water lightly. Some seeds benefit from a technique called scarification or stratification. This involves nicking the seed with a sharp knife and then soaking the seeds overnight before planting them. This helps them to germinate faster. Your seed packet will tell you if you need to do this technique. Label: Make sure to put a label in your containers. Seedlings look remarkably alike when they are small! Water: Keep planting mixture moist, but not waterlogged. Heat and Light: Seeds and seedlings need a well lit, controlled environment. between 50-70 degrees. Transplanting: Once your seeds sprout and have two small leaves, they will be ready to transplant into a larger container. Water the seedlings well, then loosen the soil around the seedling and its roots with a stick. Lots of gardeners use chopsticks as a tool for this task. Transfer the seedling to a larger container by gently holding it by one of its leaves. Do not hold it by its stem, it is too delicate. Ease it into the new planting hole and gently tamp down the soil around the seedling. Water and keep out of the sun for 24 hours to recover. Label Again!! : Make sure to put a label in every container. You think you might remember what a particular vegetable looks like but you can be surprised. Zucchini seedlings look like summer squash which looks like butternut squash which looks like pumpkins which looks like melons. Take the time to label! Getting ready to plant outdoors: Seedlings need to be hardened off before you plant them outside. The process of hardening them off lessens the shock they sustain when they move outside. To harden off your seedlings, put them outside in a protected, shady spot on a mild day. Leave them out for a couple of hours then bring them inside. Over the next few days, increase the amount of time they are outside and increase the amount of direct sun they receive until they are out 24 hours a day. Keep watering and fertilizing them well. Transplanting Outdoors: When the plants are hardened off, they can be planted outside. It’s best to plant on a cloudy day at the end of the day. This lessens the shock that the plants receive when transplanting. Gently remove them out of their containers into their planting hole. Tamp down the soil and water well. Make sure to transfer your marker so you will remember what you planted. Posted on January 21, 2012 | Comments Off on Winter is finally here! Thank you to everyone who ordered seeds, tubers and supplies through our CCOG Fedco Fundraiser. We appreciate your support! Winter has FINALLY arrived Concord but soon it will be time to start those seeds! Our first meeting is two months away and before you know it, the garden season will be starting again. 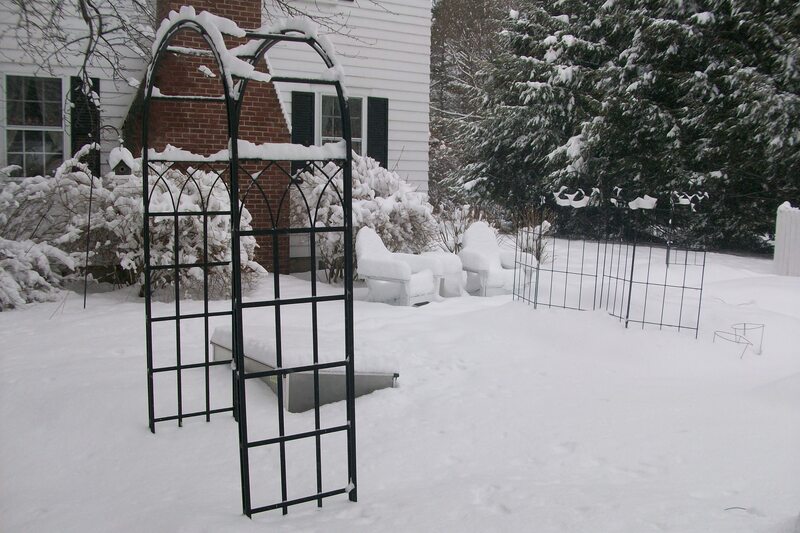 If you need some gardening inspiration, sign up for the NOFA-NH Winter Conference. The keynote speaker this year is Frances Moore Lappe, author of Diet for a Small Planet, a powerful book that launched the local food movement 40 years ago. She has a new book out, EcoMind:Changing the Way We Think, to Create the World We Want. The conference takes place on Saturday, March 3 at Sanborn Regional High School in Kingston, NH. The conference is always a lot of fun and a great way to get inspired for the coming season. Comments Off on Winter is finally here! 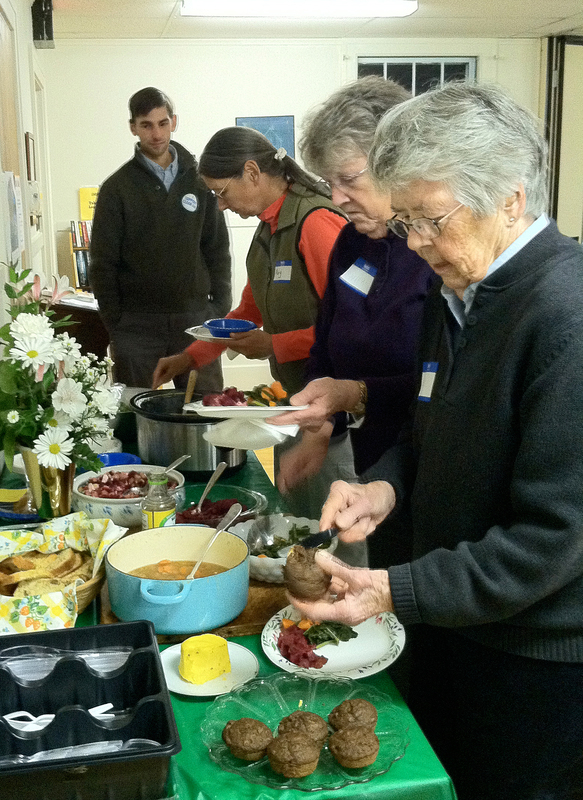 We had a good turnout for our October meeting and harvest dinner. We had a ton of delicious food. Stayed tuned for recipes in future posts! At our meeting, we discussed our successes and failures in the garden this season. It was a time for bragging (a little bit) and a time to get some suggestions for avoiding problems next year. Laura showing off her flint corn. 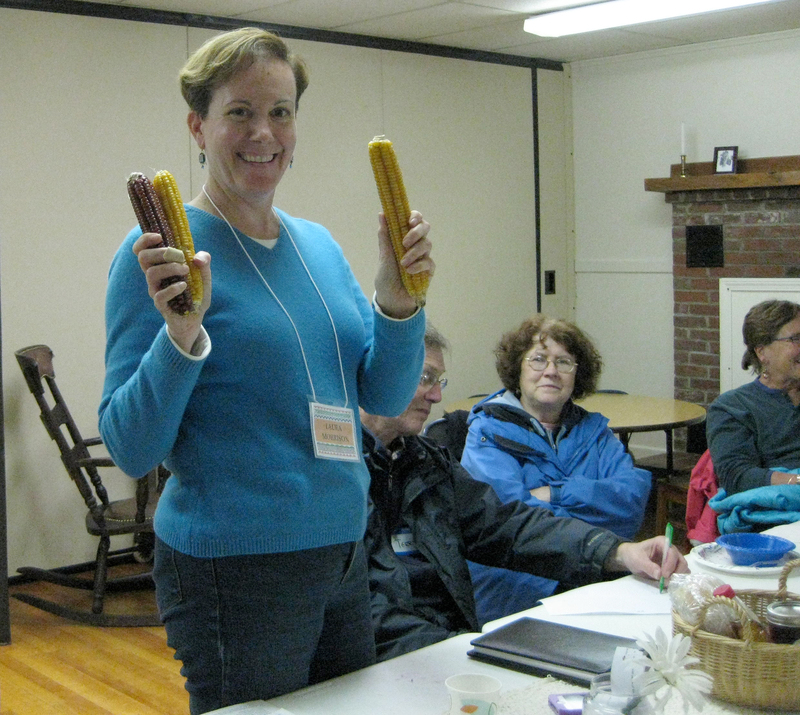 Laura started off by showing off the beautiful flint corn that her husband, Scott, grew in their community garden. This was the third year Scott grew flint corn for making cornmeal and it was the best year yet. The seed was Organic Garland Flint Corn Seed sourced from Butterworks Farm. Terry and Reggie had good success with greens in their garden this year but the peas and the radishes did not do well. They had lots of foliage but did not form vegetables. It was suggested that they might have too much nitrogen in their garden which is why the plants produced a lot of leaves. A soil test would be a good idea for next year. Karen is an avid weeder and likes a nice, clean garden. This year, she was careful to mow around the edges of her community garden and that helped cut down considerably on her weed issues. She had problems with her brussel sprouts. They did not form many buds and then the buds were not tight. It was suggested that she top off the plant once it grows to a nice size and that will force the plant to concentrate it’s energy in forming buds and not growing taller. Eve and Mike did very well with garlic this year. Steve agreed that it was a good year for his garlic as well! Eve and Mike’s challenge this year that they were harvesting carrots that seemed healthy had many “fingers” attached. The advice given was that their soil might be too rich which encourages excessive growth. Not enriching the soil and planting the carrots in the same place next year might take care of the problem. In addition, Mike HATES to thin carrots and carefully transplants seedlings evenly spaced into the garden. Karen suggested that he get coated seeds so that he can easily see them and just plant the seeds a normal distance apart rather than going through the trouble of transplanting. Mike was thrilled! The group helped troubleshoot problems. John shared his experiments using his Brix Refractometer which tests the sugar content of fruits and vegetables. Healthier, more nutritious foods often have a higher Brix reading. John shared his discovery of a beautiful pear tree he found by the Merrimack Courthouse that was loaded with fruit. Jonathan already had gleaned some of those delicious pears! Steve had a huge harvest of garlic this year, but it was a bad year for tomatoes. Next year, he is rotating his crops again and using copper sulfide as a preventative measure. Copper Sulfide is an organic treatment for many plant diseases. Jonathan didn’t garden much this year but his Bhutanese tenants did garden in his backyard. Hurricane Irene blew down a big maple in his yard and although he is sad for the tree, he is happy he will have a lot more sun in the yard and plans to expand his garden next year. Claudia had cutworm trouble but just kept on replanting, and replanting, and replanting until the cutworms gave up! Her big victory this year is that her fig trees produced luscious figs this year. She had so many, she had to freeze some. Jeff had a “Fair Season” and was especially happy with his Purple Royalty Beans which grew in a relatively shady part of his garden. His Calendula did very nicely and he had great kale. John had a good year for weeds! He stopped weeding about July 4th and then the garden got away from him. In spite of it all, he was still able to harvest a good amount of produce. Judy shared that she puts landscape cloth down in her paths and lots of straw mulched on her beds and this was the first year she didn’t have to fight the weeds in her garden. Judy said that ” I harvested advice from CCOG!”. Her big success this year was her crop of gourds. She grew about 20 gourds and looks forward to creating vessels with her treasures. Peg and Nicki had a banner year for butternut squash and cucumbers. They kept a few for themselves and donated the rest to the Friendly Kitchen. They were amazed by how much they had to offer! Marie had a great year for tomatoes. She roasts them with garlic and basil at 425 degrees for about and hour and a half. Then she freezes them and uses them all winter long. Delicious! Mary had success with watermelon (YES! WATERMELON!). We all drew close while she shared her secret. She laid out black plastic, put holes in it and planted her seedlings. The watermelon loved the heat that the plastic attracted. One Moon and Stars was as large as 38 pounds. In New Hampshire! We were all in awe. We all had a great time and learned a lot. It’s amazing how much we can help each other. What a great community of gardeners! Join us for our Annual Meeting on Wednesday, November 2nd. We will have elections and brainstorm for next year. Details are available on the Calendar page. One of the most destructive early season pests of crucifers and certain root crops in NH. It can cause severe injury to cabbage, cauliflower, broccoli, Brussels sprouts, radish, turnip, rutabaga, beets and celery if not controlled. The adult fly is similar in appearance to the common house fly, but smaller (1/4-inch long). It is dark, ashy gray with black stripes on the thorax and black bristles over the body. In the spring, female flies are commonly seen flying close to the ground, depositing small white eggs in cracks and crevices near the stems of host plants. Larvae destroy plant roots by their tunneling habit. This will often cause young cabbage, broccoli and cauliflower seedlings to wilt and die. Plants like radish and turnip become scored with feeding trails, making them susceptible to attack by disease organisms. There are typically 3 or 4 generations of CM each growing season in New Hampshire. Cover cabbage family transplants or newly-seeded rows with floating row covers until June 1, or delay planting until then to foil the first generation of egg-laying cabbage maggot flies. Alternatively, protect cabbage, broccoli, cauliflower and other cole crop transplants with barriers made by punching a hole in the center of a six-inch square of tarpaper and slitting the paper from one corner to the center hole. Then place the tarpaper square flat on the ground, with center hole snugly encircling the stem of the transplant. Bottom Line for Pest Control…. OBSERVE! Use floating row covers to minimize heavy infestations. Squish or dispose of pests in container of soapy water. Dispose of garden debris. Mow your borders and dispose of standing weeds. If your soil is strong, your plants will be strong and able to withstand some assaults—the plants may be a little ragged for a bit but they can recover! And remember—this is supposed to be FUN!